So… it’s time to come clean. I was very much in denial of how sick I was during my pregnancy and even during the recovery period after my c-section after a failed induction that they said was necessary because I could start seizing in a matter of days. Yay preeclampsia! BUT, I’m finally back to my old self (which I’ve said maybe four times over the past three months, but I swear this time I’m telling the truth!). Not only was I able to meet a revision deadline, but I’m already working on my next book…and man—it feels GREAT to be back at it. 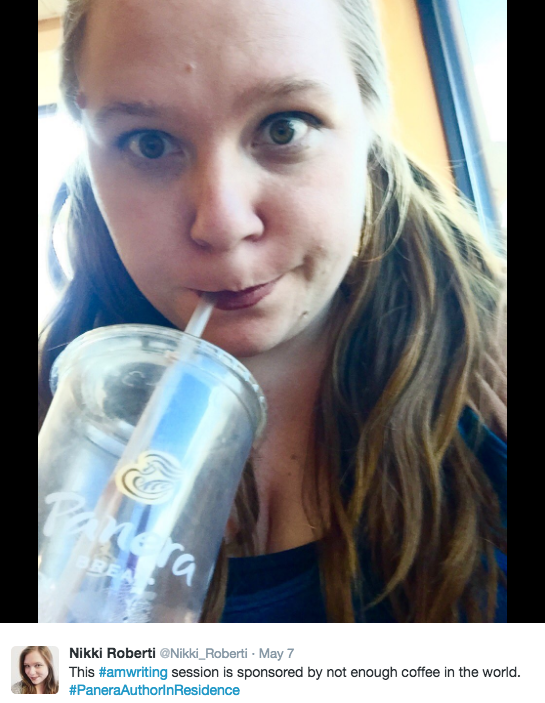 I’ve taken up working almost exclusively at my new office away from home…Panera Bread. I sorta kinda dubbed myself the unofficial Panera Author in Residence. Though, I did have an experience recently where Panera was closing in an hour but I REALLY wanted to get at least an hour or so of writing time sans crying baby so I tried out a cool coffee house near the local university. Let’s just say, I felt too old for that hip joint (pun kinda sorta intended). Anywho, in addition to the new baby, I decided to quit my day job. I’d been working toward coming back to full-time freelance for a couple of years (pretty much since I gave it up to sit in a cubicle all day as a writer for an organization…wondering why the heck I volunteered to sit in a cubicle), so now that’s finally possible! It’s been slow going getting my freelance clients back with adjusting to new baby life (I had to quit many of the ones I did on the side due to how sick I was the past couple of months), but everything is going well, and I’m super hopeful. I’m also still the query editor for Stark Contrast Editing (so if you need query help, call me!) and I am taking a couple of independent editing projects on the side. PLUS I’m back working with the AMAZING Brenda Drake again as one of her assistants and contest coordinators. I’m so excited to get back into the swing of things as Pitch Wars is gearing up again. Speaking of which, I’ll be launching a Pitch Wars mini vlog series on things potential mentees and selected mentees need to know. I have a few ideas already, but if you have any questions you want answered, feel free to tweet me or leave a comment below! In the meantime, check out this post from last year to the 2015 Pitch Wars mentees. Thanks for all your support and encouragement over the past couple of months. I’m looking forward to this next chapter of life and for all the amazing author things ahead!